There is nothing more Australian than a lamb burger and with the tomato chilli jam mayonnaise your customers will be lining up for more! Preheat the oil in a frying pan then pan fry diced onion until translucent. Remove then set aside. In the same pan lightly fry the sliced onions until golden brown, keep hot. Combine lamb mince, lamb sausage meat, cooked onion, COLMAN'S Dijon Mustard and pepper. Mix well. Shape the lamb mince mixture into (160 g) burger patties, then cook. Pan fry the cheese until golden brown on both sides. 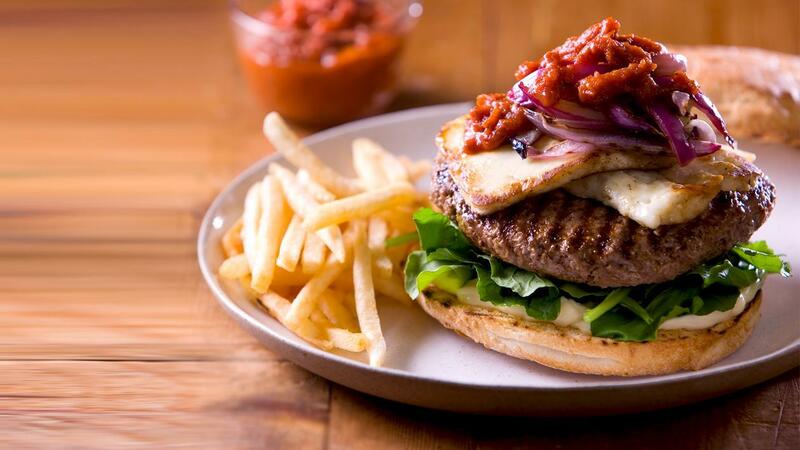 Assemble the burger in the following order - toasted bottom burger bun, HELLMANN'S Real Mayonnaise, rocket, lamb pattie, haloumi cheese, grilled onion, KNORR Italiana Napolitana Sauce GFand finally top burger bun.